Are you old enough to begin to care about your retirement income? Well, if you are of voting age, perhaps you are. In a manner of speaking, you do, and that is the subject of this article. By most measures, government employees are doing well. The government awards them with generous retirement funds, which it properly puts aside to be available for future use. The problem is that these lavish benefits are weighing on government debt at a time when government debt is in near-crisis mode. Moreover, there is an element of unfairness involved, because the bottom line is that someone must pay for these overly generous benefits. That someone is you and I. Social security’s bookkeeping is not exactly as solid a system as someone regularly meeting their mortgage payments with the expectation that it will culminate in home ownership (Of course in the last three years, a sluggish economy has undermined even this situation for some). Now, some political voices claim that there is no danger and that the system is solvent. Others say the system is simply the federal equivalent of a giant “Ponzi scheme”. 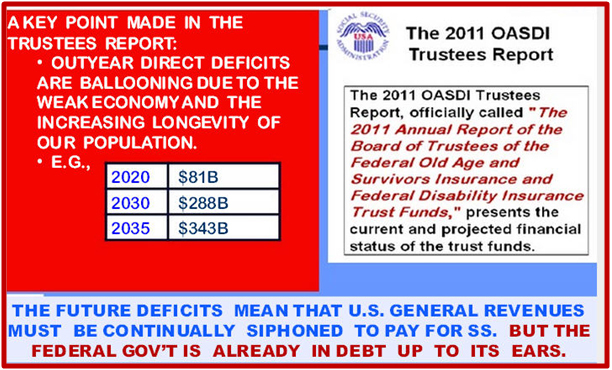 This difference in viewpoint is due to the somewhat obtuse role played by “Special Issue Bonds” or SIBs. SIBs are an accounting method in which the government spends some of the real monies deposited by citizens into the social security system and replaces them with SIBs. SIBs are essentially IOU’s the federal government pledges to pay back to social security enrollees at retirement age, which are backed by the full faith and credit of the United States. However, these “payback” funds currently reside nowhere but in federal ledgers. Accordingly, the system only remains solvent when the funds that currently working Americans pay into social security equal or exceed the amount of money retirees are drawing from it. That circumstance is now changing due to the “boomer bubble”. As aside, any system that requires a constant influx of new entrants to fund the income streams of older members certainly sounds like a “Ponzi scheme”. Thus, demographics combined with other Federal budgeting issues calls into question the government’s ability to honor its retirement pledges to working citizens today. One can appreciate the situation more fully, when one realizes that to make good on its pledge, Congress must vote for tax increases, cuts in benefits, or use inflation to cheapen the value of funds paid out. All of these are distasteful to citizens, and therefore to politicians who must run for re-election. So the problem has been denied, disavowed and kicked down the road for many years. This whole circumstance is likely associated with the recent Standard & Poor’s modest downgrading of America’s debt rating. In other words, in the past, monies paid out to retirees were readily replenished by incoming new workers, so the system seemed stable. But now and for several future decades, incoming workers will be insufficient to pay the bill for new retirees. So if you are 21 years old today (or 30 or 50), you should be concerned about taking your social security retirement income. Specifically, as American citizens, you should be urging your elected representatives to convert the system into a more stable structure. Entitlement spending is only one of America’s many fiscal challenges. The country must budget wisely and responsibly to assure its continued leadership and competitiveness in innovative products and manufacturing, both of which new and equally ambitious nations are successfully challenging. America has no special claim to continued global leadership, beyond what its people earn by virtue of their education, ambition, work ethic and competence. If you are interested in learning more about these issues, further detail about this article is available in a presentation here. This entry was posted in Finance and Economics, Policy, Politics, Social Security and tagged Baby Boomers, Federal debt, Retirement, Social Security. Bookmark the permalink. She notes how the employees have had their retirement benefits all but stolen, but even as that was done the top executives actually padded theirs! My point is that it’s easy to over simplify. I could use Schultz’s evidence to argue the 99% vs. 1% issue on retirements — middle class victims to corporate greed. One could look at government employees (including the military) as getting too much. I think the reality is that what was rational and made sense in the past no longer works because of demographics and economic change. There are a lot of people like me whose retirement savings depend primarily on investments (including through work with matching funds from my employer). That looked really good through the late 90s, but now a large % of the population is going to find retirement investment plans not paying out because the assumed growth rates were way off (even conservative ones!) So perhaps we should: a) have state and local governments restructure benefit plans to have more realistic programs given the economic realities; b) consider raising the retirement age; and c) reform social security so that it can perform in the long run. But, of course, the devil is in the details! Very well said. Government workers do receive very generous retirement benefits, but that’s largely due to the fact that for a very long time government workers were paid a lot less than their counterparts in the private sector. And, there’s another twist to this: over the past 30 years, and especially under Bush II, more and more lower level government jobs have been outsourced to private industry, resulting in an increasing percentage who are mid and upper level management, technical and senior staff, especially in defense, homeland security, IT and other specialized agencies, who by the way are more competitively compensated. It’s not so simple as “Government workers are pampered”. The devil is in the details. Regarding Social Security, it’s true that it has serious flaws, a big one being that it was designed when people died at 68-70 not 78-85 (or more) as they do today. Secondly, it was never meant to be the default retirement pension plan; rather, it was a safety for those who had no other retirement income. Back in the ’30’s, if you had a job you most likely had a pension, either through your company (if you were white collar) or your union. That’s not true today except for ever-dwindling union members or senior executives. Social Security and Medicare should be means-tested; but, critics should remember that Social Security and Medicare were promised to everyone in order to quiet critics who said it would be unfair otherwise and to win Republican support for passage in Congress. I’m all in favor of Sean’s belief that people should take more responsibility for themselves. But, bear in mind that it’s pretty hard to save for retirement when 100% of your income (if you even have a job!) goes for food, housing and survival. It’s only a luxury of the more affluent who think that everyone just should fend for themselves and that no one should be dependent.on the Government for anything. The fact is no one has access to 100% of their income. The government taxes away 15.3% of one’s income (both employee and employer shares). I’ve worked it out that if if a two earner family, one at $9.00 and the other at $12.00 per hour worked from age 22 to 67 and invested it at an average of 2% return , they would have almost $645K in the bank. They would have had the money if the government had not stolen (er … taxed) it to give to some one else. I was unemployed for exactly two months in my working career. I could have, but did not, defer immediate gratification and save 10% every paycheck. I spent my 401K’s for things I just “had to have”. A government, corporation, or person pledging or promising to do something in the future may or or may not succeed because the future is, well, uncertain; it is not an enforceable contract. Government or corporate pension systems both have a higher risk of failure because the future beneficiary does not own the asset which is to gain compound earnings to build the future income stream. 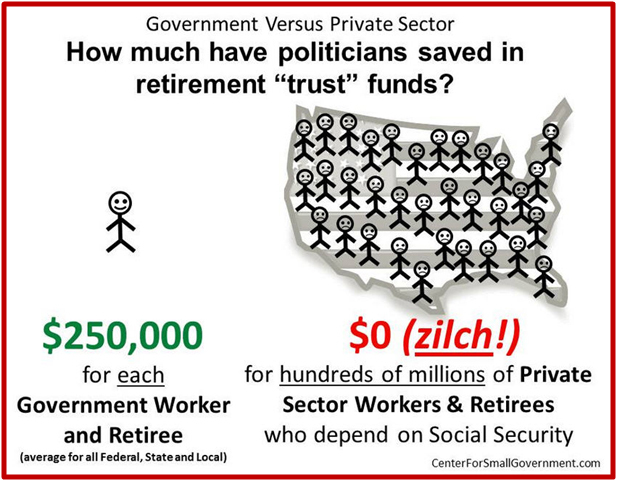 As long as the government or the corporation or the union (think Teamsters) owns the pension funds and the reserve rules are set by politicians, than no one’s pension is secure. In contrast, when asset ownership is spread among millions of persons and the assets are managed by thousands of companies and all are knit together with enforceable civil contracts, then the retirement system will become as stable and rewarding as the underlying economy. The more stable system is one in which government does not guarantee financial outcomes. Is there a market for SIB’s? Obviously, you don’t invest in the stock market. “Stable?” “Rewarding as the underlying economy?” I hope you’re not retired. I don’t invest having planned and executed my financial behavior badly. I’m retired solely on SS, which is not a contract to which I can hold subsequent Congresses. In fact, SS itself cannot even go to court to force Congress to redeem the SIB’s. In both SS and defined benefit plans, there is only one buyer and only one seller (neither the taxpayer nor the beneficiary, like me, has any say in the matter). An economy has many buyers and sellers whose innumerable decisions lead to long term stability over time even though there are short term fluctuations. The empirical record is clear. Long term diversified portfolios for which investments are regularly purchased, yield substantially good results. Government manages the economy as successfully as it manages the weather.. Thanks very much for your constructive comments and thoughts on my 1st blog here at ROARR. Although I agree with a number of the points made, I’d like to offer a few short responses on a few of them. Scott & Charles: you both cite that Gov’t workers are less well paid than private industry and therefore the added gov’t. perks and benefits are more or less equalizers. While I don’t doubt that there may be some cases in which that is true, in the slideshare ref I gave above, there are several charts that offer contrary data. Pls take a look at charts #9-11 and #30. Also pls check out this reference: Wall St Journal, Andrew Biggs and Jason Richwine, Feb 24, 2011, “The Public Worker Gravy Train”. So it might be interesting to dig a little deeper to better understand why the data seems to be somewhat contradictory. Orthovox: I find my views pretty close to yours. I was told by my parents as a young man going to my first job: Take 10% off the top and put it towards your retirement. Do it from every pay check. Treat that as an expense, like rent or the phone bill. It’s an expense for the “future you”, so it’s important. I also infer that you might generally agree with me that Social Security could be improved if a private channel were to be allowed to compete fairly. I’m thinking of a scheme, where the Citizen is offered the option of keeping his SS contribution in the gov’t plan OR taking the funds with a mandate of putting it in a private special “mutual fund” ( which has 401k rules and perhaps has a more conservative regulatory mandate than just any mutual fund). But I think the competition to SS would be healthy and perhaps mitigate the propensity of Congress to “borrow” the SS funds for other “good deeds”. You also seem to suggest that the idea that the Gov’t is simply being altruistic in paying out added funds ( beyond those paid in by the Citizen) to those who haven’t put some savings away for the future – is a bit suspect. I agree with the notion that the gov’t has no additional funds of its own. Anything further that is given to citizen A beyond his own contribution and earnings therefrom, has been taken from citizens B, C, D etc. Thus the gov’t is forcing a kindness from Citizens B,C,D who each might prefer to give that money to a relative in need. This ‘charity’ might best be organized by a true Charity and the gov’t role reduced to a backstop, when all else fails. Unkind? I think not and importantly it is probably more effective. Anyway Scott, Charles and Orthovox, thanks again for your thoughts and contributions to a more elevated and civil dialog on National issues. You are welcome and thanks to you for putting together a good mix of the rational and ideological.